28 Nov, 2018 in Uncategorized by Minette Riordan, Ph.D.
After 10 years of publishing a monthly magazine, I learned that planning was the key to never missing a deadline and to making consistent money. Sadly, it took me a year or two to realize that those same planning skills would translate nicely to my coaching business. Doh! I knew that the process had to be fun, visual and colorful or it wasn’t going to happen. I also didn’t want to waste months creating a plan that would sit on the shelf or on my computer gathering dust. I needed a roadmap. A 1-page visual reminder of where I was headed and how I would get there. So I created one that made me happy, I even wrote a book about it in 2015. Since then, I have taught our unique Visual Business Mapping™ process to hundreds of creative entrepreneurs around the world. Over the next 12 days, I want to share this process with you. For free. One day at a time. Each day will build on the previous one until by the end of our 12 days of business planning, you will have a complete Visual Business Map in place for your creative business. Check back to this blog post each day to get the next step. Some of the steps might take longer than others but if you spend about 30 minutes a day on this process, it won’t feel overwhelming. In fact, you will feel excited and motivated to take action! Not having a business plan is often cited as one of the top two reasons businesses fail. And our version won’t take weeks or months to create. Plus, it’s colorful, creative and fun to complete. 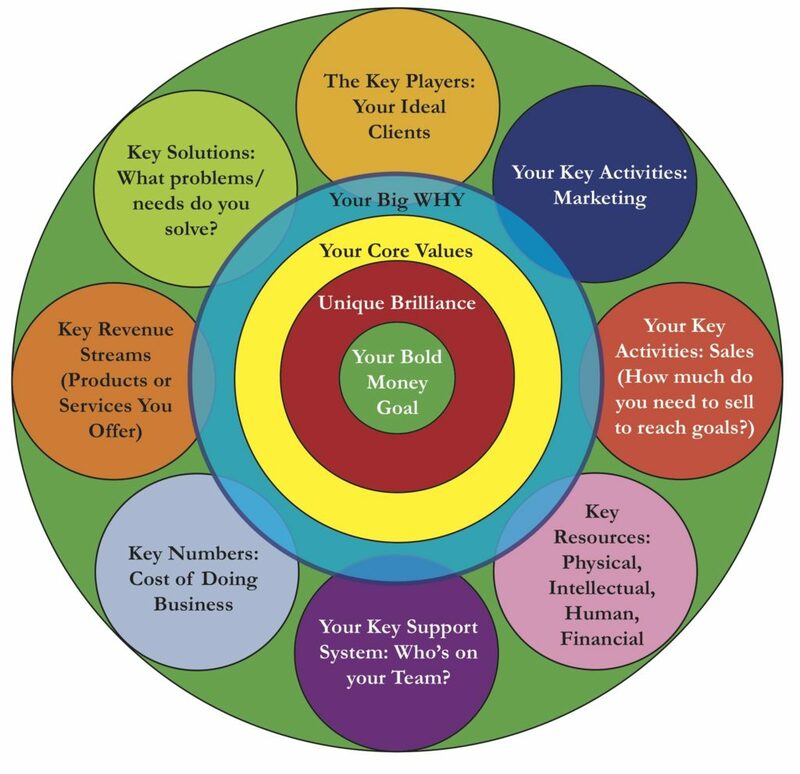 This one-page Visual Business Map will serve as an effective guide for doubling or even tripling your income. And it will be pretty enough to hang on your wall. One hour of planning can save you ten hours of doing. It’s time to work smarter, not work harder. We all need a roadmap to get us from point A to point Z. Your visual business map will help you set clear, attainable financial goals based on the lifestyle you want to create. Trying to find the balance between delivering services and acquiring new clients? This template will walk you step-by-step through the most effective marketing and sales strategies for your creative business. Step 1. Download the Visual Business Map workbook with your templates and a description of the process. Step 2. You can print out the blank template in the workbook, draw one in your journal or grab a poster board or large sheet of paper to work on. For me personally, the bigger the better! Step 3. Watch the Day One Video here on setting your bold money goal for 2019. Step 4. Come join us on Facebook in the Productivity for Creative Business Owners group. This will be the place to ask any questions and to share your progress. I will also be working on my own Visual Business Map live. See you tomorrow for day two where we will look at your unique brilliance and all the reasons why YOU are amazing and people should hire you. Because it takes two turtle doves and a little magic to build your business.